Success Stories w/ Low back issues? Just got some bad health news----I have 2 disc bulges in my low back that are hitting nerve roots and doc said not to ride upright bike anymore. He said a recumbent "may or may not" work depending on positioning. 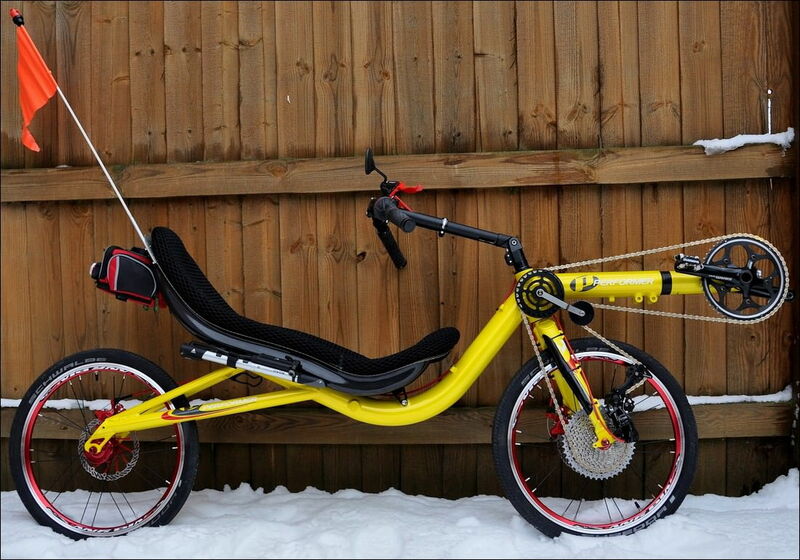 I am awaiting delivery of my first recumbent (performance high racer) with nothing but hope that it will work out. I am looking for success stories from others w/ disc protrusions who have been able to continue cycling with recumbents. I am only 40 and the prospect of not being able to do my main form of exercise and recreation is very depressing. I don't have any serious back problems, but like a lot of folks, have occasional soreness in my lower back and/or sciatica pain. I find that going for a ride improves these conditions more quickly than any other course of action I can take. I would have suggested trying out at least a couple of recumbent bikes and trikes before plunking down your money. I don't have chronic back pain but the few times I was afflicted with a bad backache lasting several days, the one thing I could continue to do was ride my trike. It seemed to help shorten the process of returning to normal. I don't know what part of Wisconsin you live in but there are several shops that carry a variety of recumbents. The one I would think about visiting is the Hostel Shoppe in Stevens Point. They have the upcoming Midwest Recumbent Rally in early August where you could try out a pretty good selection of bikes and trikes. There is also Budget Bike Shop in Madison but when I visited them in 2005 they had a limited selection. Wheel and Sprocket in Hales Corner is often mentioned as a good recumbent shop. Of all the recumbents to start with, you may have picked one of the more difficult to learn to ride. I had a friend who owned several recumbents but lusted for a high racer. He quickly lost enthusiasm after test riding one at the Midwest Recumbent Rally in 2005. I had no problem hopping on a Linear LWB and taking off on a ride the first time I tried it. Some are more difficult than others. Yeah, I may have jumped the gun with the bike. I test rode some bents at budget bike/ motorlessmotion and they were all too big, used, too high off the ground, and the salesperson was not very knowledgeable at all. Hostel Shoppe seems to have mostly trikes now and not a large selection of bikes. I need something to take the weight off my low back and am still young enough that I want speed and ability to at least be in the same ballpark (understanding the yo-yo effect and need to develop bent legs) with my riding friends. I am also not a fan of the recurve/heavily padded seat. And then there is the price. I can live with $1500 if it doesn't work out. Can't live with $2000 + if it doesn't work out. I also like to mod my bikes. I am already substituting 451 wheels for the stock 700 (with appropriate fork) and planning on adding vibration bobbins to seat interface. The upright body position compresses on the spine and discs. I had several bulging discs in my mid 20's. Through simple strengthening exercises and diligent assessment of body posture when awake and asleep (don't ask how that was done) I was able to overcome it after a year. Had to deal with relapses for 20 years, but now there seems to be no pressure on the nerves. Certain seating positions are terrible for me, and others are not. I do find a traditional road bike with the curly bars helps my back significantly, but also find the recumbent is OK as long as the lower back is properly supported. Every injury is particular to the body in which it occurred. Get a second and third opinion and see a PT that is up to date with new methods for this type of injury. If it is a genetic disorder, you're stuck with it. Bulging disc in 1990 at age 30. Partial discectomy eliminated the constant excruciating pain, but upright cycling of any distance would cause pain to recur. I went 'bent after two years of trying fitting, exercises, PT, etc. Eventually I stopped listening to friends' helpful advice and started listening to my back. Since that time I discovered ultracycling and randonnduring. I suppose I'm retired from ultras (for now), but reached my goal of 400 miles at the National 24 Hour Challenge at age 54. I've completed multiple SR series, one 1500k, four 1200ks including two PBPs. I can ride an upright some now without issue. I commute year-round, and no longer own a car. I think that's a decent success story. I was hit by a car when I was 13 and crushed a vertebrae which healed misshapen. I've had trouble all my life with running, walking, and cycling. 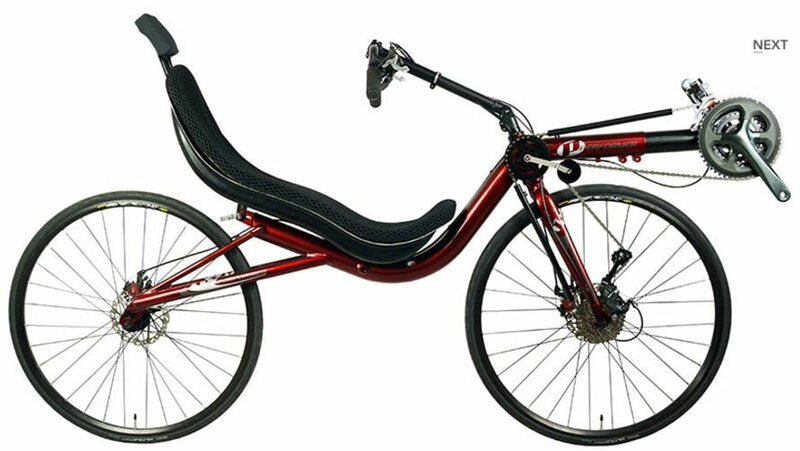 However, rarely had trouble on a recumbent unless I got the leg length set too long. If I reach, it tends to arch the lower back and then I have back trouble. I've been riding bents since 2003 and can dial in a new bent pretty fast but sometimes I still get the leg reach a bit long and start getting sore. I've learned to correct it pretty fast. Short answer: You may have little back trouble at all. I once tweaked my lower back so badly that I was sleeping on the floor for weeks. Did a long bike ride on my recumbent (200km) and by the end my back felt perfect. My brothers have serious back issues. I think riding recumbents since 1994 has prevented problems for me. Current ride is a Bacchetta Giro 26 with a RANS seat. If you are going to replace the 700C wheel with a 451, why didn't you instead choose a low racer.? Performer Cycles makes them too though I am not a fan of the 16" 305 wheel on the low racer model. There is a very limited selection of tires for the 305 wheel. The other thing to consider is - what is the effect of changing the front wheel on handling? The frame geometry was designed with the larger wheel in mind and going to a 451 wheel may adversely affect handling. The other thing that would put me off is that all of their bikes are OSS and I am a real fan of USS. First recumbent was a BikeE AT (with OSS) and the second one, a used 1997 Linear LWB had both (OSS installed and USS parts in a box. Quickly switched out the OSS parts and went to USS. My other bike, an Haluzak Horizon also has USS. Wouldn't have bought the Zak if it had OSS. I ride a Bacchetta Giro 26 with Recurve seat. Unfortunately it tends to tighten my lower back. I once rented a Coosa and rode it all over the place and had no issues on it. If I were going to do it again I’d buy the Bacchetta Bella or whatever they call it now. If you are going to replace the 700C wheel with a 451, why didn't you instead choose a low racer.? Performer Cycles makes them too though I am not a fan of the 16" 305 wheel on the low racer model. There is a very limited selection of tires for the 305 wheel. 1. I did not want a 16 wheel for the reasons you mention. 2. I am intrigued by the FWD. The other thing to consider is - what is the effect of changing the front wheel on handling? The frame geometry was designed with the larger wheel in mind and going to a 451 wheel may adversely affect handling. Based on others' similar conversions (detailed on bentrrider), the smaller wheels spread out the wheelbase and make the handling more stable. It also adds more weight to the front, which is good for the FWD on hills. I tried a friend's USS, and did not care for it at all. Not trying to talk you into or out of anything, but Performer offers 4 lowracer models, if you count the folder. Only one of them has a 16" front wheel. I can't tell from looking if it's a 305 or a 349 version of 16" wheel. The other thing that would put me off is that all of their bikes are OSS and I am a real fan of USS. None of that can possibly be true! None of it. Wheelbase is what it is, unless you modify the frame. Changing the wheel size changes the wheel size. That has definite consequences for ergonomics, handling and also performance, but it does not alter intrinsics of the basic chassis configuration such as f/r weight distribution. As for 'making the handling more stable'. Oh boy, are you in for a shock. The reason no normal human can 'track stand' a recumbent but tens of thousands of ordinary Cat 5 road racers can at least approximate it on DF bikes is because the higher your eyepoint above your center of gravity the easier it is to find the balance equilibrium. You have much more time to react to the forces trying to destabilize you. Don't be in a hurry to sell those 700c wheels. Last edited by Leisesturm; 07-12-18 at 11:41 AM. I don't know why you have to be so condescending and hostile. 1. My legs cannot reach the ground with 700cc wheels; hence that configuration is more unstable for me. Further, lower and smaller wheels are not as susceptible to cross-winds as larger wheels. 3. Regarding wheel base, I will give you that if measured from the center axle, it will remain the same, but smaller radius wheels mean the distance between the points of tire contact on the ground should be greater than with larger wheels. Last edited by Skankingbiker; 07-12-18 at 01:02 PM. I am disagreeing, I am rarely personal about it, but I do get annoyed when people get attached to fallacious theories and resist the truth. I also grind my teeth when posters throw perfectly appropriate analogy or metaphor back in my face, to wit: "why would I want or need to trackstand", smh, I have no need to trackstand either, but I have had to troll behind elderly pedestrians from time to time. I guess I could just stop, but I'd rather keep my feet up. You did not mention your problems with 700c wheels. I took your post at face value. Lower and smaller wheels that are NOT faired (inside a cover) will have a negligible side wind advantage over bigger wheels. I'm just saying. Point of contact with the ground is identical with the larger wheel. The two photos you posted are not to scale. The wheelbase appears longer in the upper photo because it is at a higher magnification. But there is also this. Your 700c highracer was geared for that size of wheel. The other posters that have modified theirs also invested in much larger chainwheels than OEM. You will be miserable if you do not also do the same. You switched to a shorter fork and you also lowered the rear end to match. Zero sum. Trail doesn't change, f/r weight distribution doesn't change. You're good there. 3. I did invest in the appropriate drivetrain/gearing. 4. Smaller wheels and smaller fork WILL result in less wind resistance because the vertical profile is less. Tell you what, If I don't like the bike, I will tell you you won. Fact remains that others have done this or similar conversions and been happy with the results. Nor am I a moron, which is what you seem intent on showing for some reason. According to the thread on BROL, Christine at Performer will configure a highracer with small wheels, as shown in the top pic (yellow bike.) The major differences between that and their folding lowracer are that it will have a longer wheelbase than the folder, and of course it won't fold. Note that Performer also offers a folding highracer. That said, the small wheels and associated fork will cause the rear dropouts to be about 3 inches lower than the highracer, and the headset about 6 inches lower. That will steepen the head tube (as Skankingbiker has acknowledged.) Even if the steering angle didn't change, the shorter fork will not extend as far forward as the longer one would have, meaning the wheelbase will be an inch or so shorter than it would have been with the full-size fork. Effectively, you'll have taken the folding lowracer and moved the rear wheel back several inches, which will help bias weight distribution toward the front and hopefully give better traction on climbs. It's not a contest. I don't care if I 'win' or not. FWIW I like the look of the lowered high racer. That's worth doing it all on its own. Enjoy. FWIW--With my added lumber support, I have ZERO back pain--ZERO......did 30 miles my 3rd day with no issues other than newb start/stopping errors and sore "bent legs". The bike rides and tracks straight. There is a little pedal/torque steer, but nothing overly concerning. No issue hitting the idler w/ the FWD. Also, so far, no front wheel slippage. Biggest "downside" is that the small wheels do not carry momentum very well, but that is a trade off, as I appreciate the relatively low ground clearance, which means I can rest my leg (barely) when seated. Congrats. Sounds like you got things dialed in.